This is the description from Wikipedia. 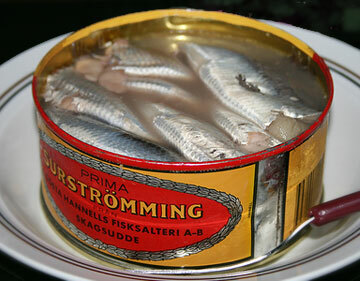 I love surströmming. It is the most amazing, exotic Swedish food ever. It is an acquired, mature taste, of course. But nothing can beat it in the late summertime, when it is traditionally eaten. Or anytime, really. You take it with potatoes, onions and homebaked tunnbröd (literally “thin bread” or “barrel bread,” the Swedish version of flatbread) and shove it down with beer and some good friends. The day after, you let your stomach have a well-deserved rest. A pure delicacy if there ever was one.